Machiya is the little sister restaurant of Kanada-Ya, the ramen bar famed for its tonkotsu ramen. There are two branches of Kanada-Ya – the original on St Giles High Street, the other virtually next door to Machiya itself on Panton Street. The concept at Machiya is something like a gastro izakaya – a Japanese pub with homemade tapas-sized plates of food for sharing. That said, Machiya looks nothing like the typical izakaya joints found in Japan which are typically quaint, dimly lit, and worn around the edges. Here, with its clean cut and brightly lit natural wood and metal interior, Machiya has much more of a clinical modern feel to it. Downstairs is a bar which offers a list of cocktail delights. Machiya’s menu is a mix of some izakaya classics and Japanese cafe staples like tonkatsu, kare-raisu, and zaru-soba. 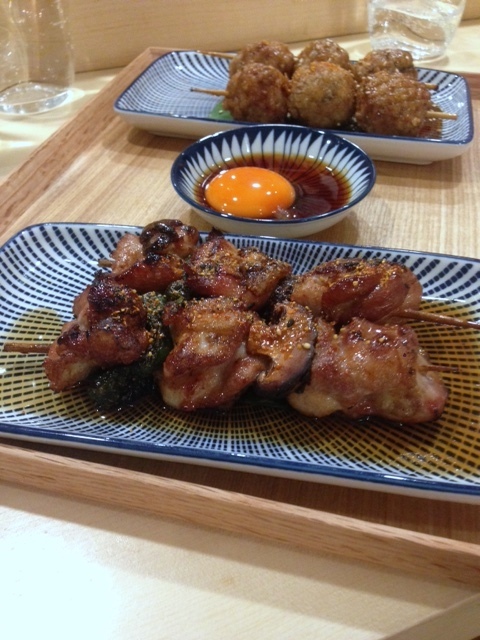 At Machiya, the chicken yakitori (£4.50) proved to be two skewers of deliciously moist and slightly crisped flesh. The chicken was well seasoned and did not need any gimmicky sauces, sometimes deployed in restaurants to hide a poor quality base ingredient. The chain of Roka restaurants offer a unique style of contemporary Japanese robatayaki cuisine, a cooking method where items of food are slowly grilled over hot charcoal. The original branch of Roka opened on Charlotte Street to much success and subsequent branches followed in Canary Wharf, Mayfair and on Aldwych. But the menu extends beyond just robata dishes. There is also a delectable selection of sashimi and nigiri, fried options including tempura, snacks, soups and rice dishes such as hot pots with lobster and miso butter. Now how good does that sound? 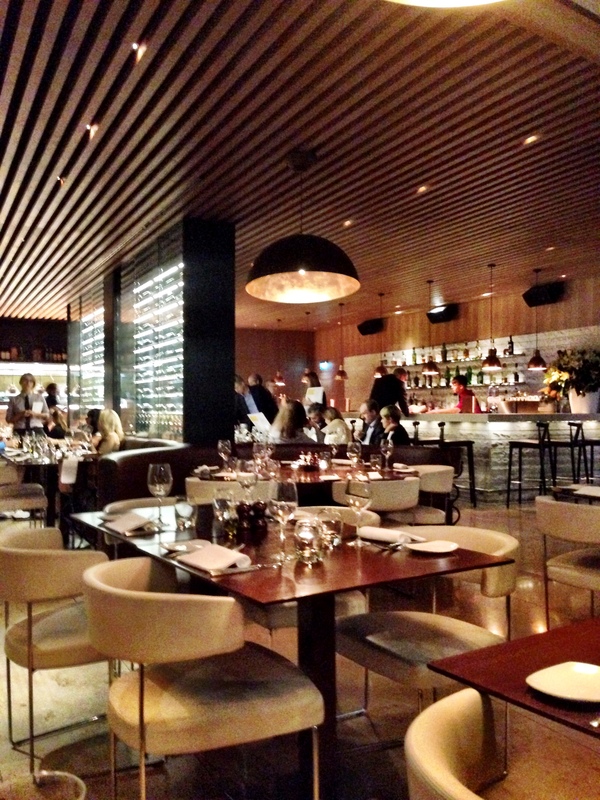 We visited Roka Aldwych which opened last November. Designed by Claudio Silvestrin who was also responsible for L’anima and Alan Yau’s Princi on Wardour Street, the restaurant is spacious and grand with a sleek, contemporary minimalist look, a style for which Silvestrin is well known. Like all the other Rokas, the robata grill plays centre stage at Roka Aldwych, and in addition to the tables in the main dining room, guests can also eat in the lounge area and at the robata bar. We started with the yellowtail sashimi with truffle yuzu dressing, mizuna and pickled vegetables (£14.60), and the spectacular scent of truffle immediately caught our attention when the dish arrived at our table. This dish was pure perfection. The quality of the fish and the balance of the truffle yuzu dressing was absolutely flawless. It was an exquisite dish and we enjoyed it immensely. If you only order one thing at Roka Aldwych, this has to be it. 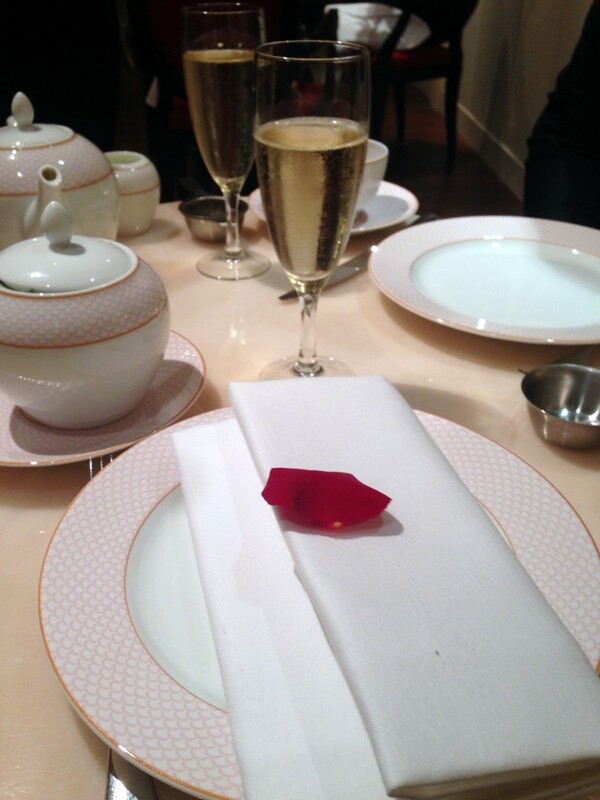 Mum was in town visiting and so I decided to take her to afternoon tea at the Rose Lounge, Sofitel Hotel St James. I love taking visitors for afternoon tea as I can’t think of anything more quintessentially English for a Sunday afternoon treat. The Sofitel Hotel is a gorgeous hotel and epitomises the height of elegance. We only walked through the lobby and The Rose Lounge, but you can tell this is one classy hotel. 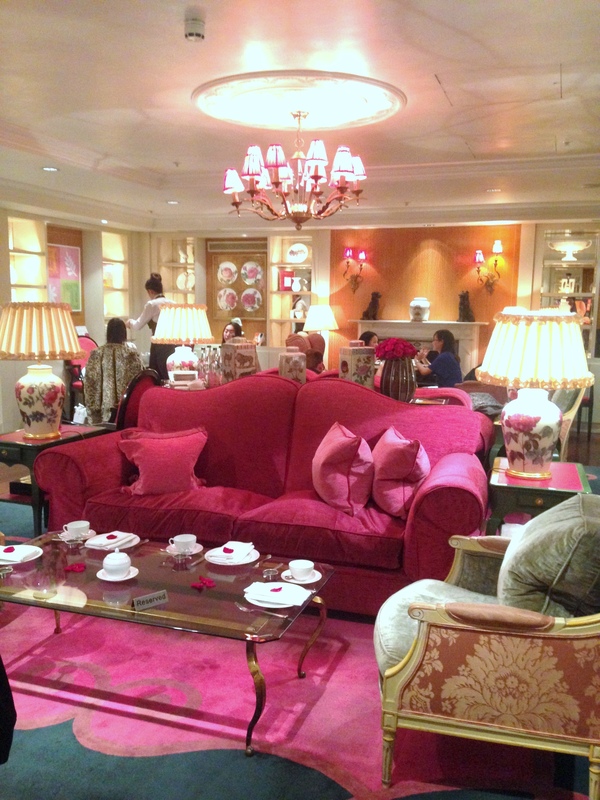 The Rose Lounge is where the afternoon tea is held and it is as pretty as pretty can be. The space is cozy and quaint, although the tables are probably a little bit too small. But we loved the décor and thought it was perfectly decorated for an afternoon tea experience. The room was feminine and charming with the glorious sound of a harpist playing in the corner of the lounge to really set the mood. Ed Wilson and Oli Barker, the boys behind the renowned Terroirs and its sister restaurants Soif and Brawn, have created a certain niche by selling biodynamic wines imported through wine specialists Les Caves de Pyrène. The practice of biodynamic agriculture refers to the use of organic, sustainable and ecological methods in wine making, and it is a practice that has gained momentum in recent years. Wilson and Barker’s latest restaurant is The Green Man & French Horn. They’ve kept the name of the pub that once graced the site where the restaurant now stands. Located right in the heart of Covent Garden, it’s a quaint little place. But it’s also a tight squeeze with cramped tables and noisy acoustics. The French menu is rustic, homely and comforting. 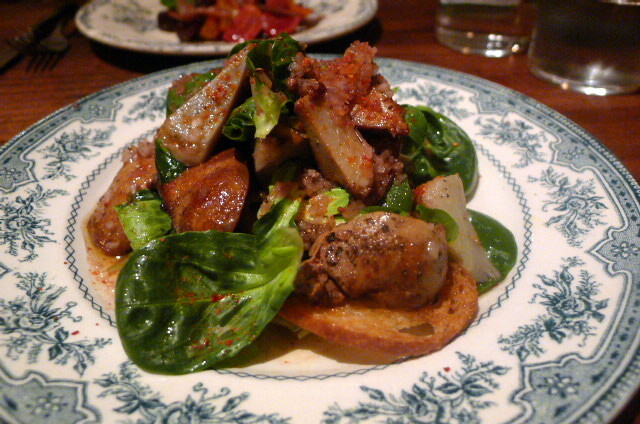 A starter of chicken livers (£8.50) with artichoke and mâche were fat, silky smooth and dripping in flavour. Cooked to medium rare, they were well seasoned and superbly done. A drizzling of merlot vinegar and olive oil dressing left the dish with a lovely glaze and added a moist finish. Anthony Demetre made waves when he first opened Arbutus. Offering solid accomplished cooking at reasonable prices, it went on to win a Michelin star. Arbutus was followed by Wild Honey which also garnered a star. With such success, there was little doubt that his latest offering, Les Deux Salons, was also going to cause a buzz in the press and the blogosphere. Situated on William IV Street, just down the road from Terroirs, Les Deux Salons took over the site of a previous Pitcher and Piano. The entrance to the restaurant is striking, and inside it is just as tasteful, embodying a classic French brassiere feel boasting of leather banquettes, dark wood furnishings and mosaic marbled floors. This was designed to be a crowd pleaser, and it’s hard not to feel drawn to its design. The restaurant contains 150 seats over two floors and encompasses a buzzier, noisier downstairs, and a more intimate upstairs. 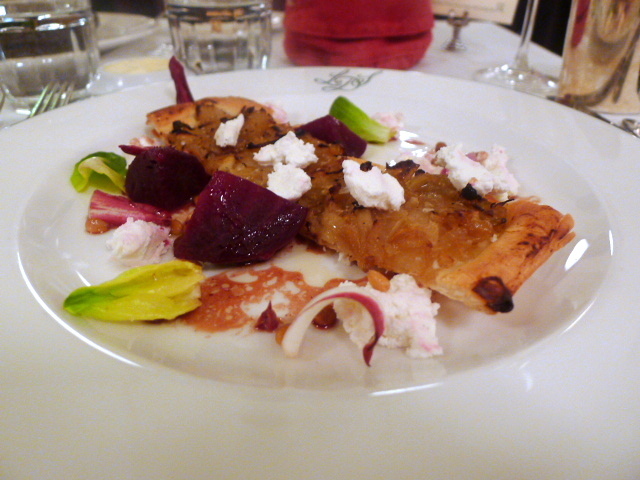 We started with a warm sweet onion tart (£6.95) which was tasty and boasted of a lovely flaky pastry. The caramelised onions worked well with the classic combination of crumbled goat’s cheese and beetroot. There were also some pine nuts for a hint of crunch. This was a nice dish but a little dry. Lupita is one of the latest Mexican restaurants to open in London (the other one that comes to mind is Cantina Laredo on Upper St Martin’s Lane in Covent Garden, right next to Jamie’s new Italian restaurant). Housed on Villiers Street, it’s in an unbeatable location for all the passing traffic that runs between Embankment tube and the Strand. Lupita is an offshoot of its sister restaurant in Mexico City, El Farolito. It bills itself as the first truly authentic Mexican restaurant in London although I suppose most restaurants would call themselves authentic. I mean, why wouldn’t you? 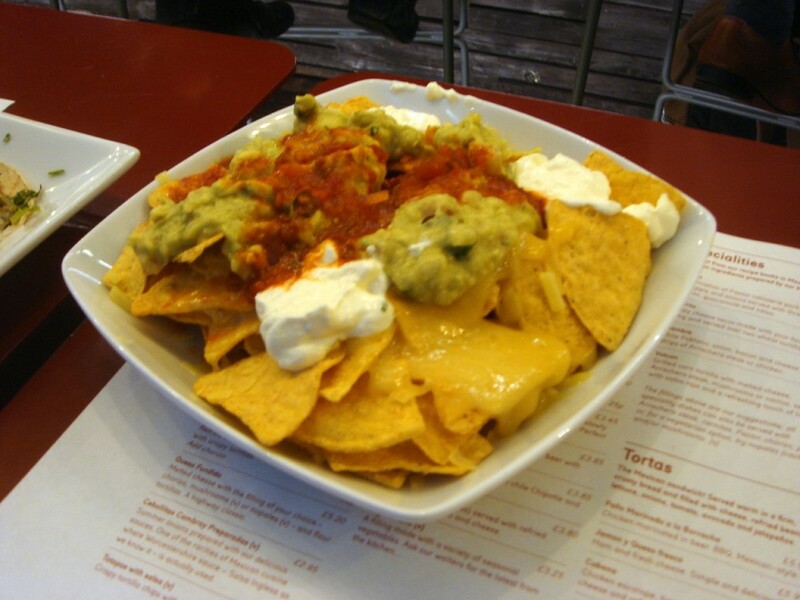 To start was a nachos clasicos (£5.45), Mexican tortilla chips topped with melted cheese, red salsa, guacamole and sour cream. Actually we should have been munching on the nachos Lupita, a meat version with strips of beef and black beans. But the restaurant got our order wrong and brought us the clasicos instead. But as the service was a bit chaotic – we got our food before our drinks – we decided not to bother having the restaurant correct our order. If you previously read my blog post on Terroirs, you would have probably noted that I have already been to this restaurant and wine bar twice in a very short space of time. So this return trip, my third visit, is really the return after the return. But hey, who’s counting? I really like the place. That, a craving for some of their super delicious duck rillette, and the feeling that I hadn’t explored the menu to its fullest potential meant I was predestined to go back. Call me a groupie, but one’s got to do, what one’s got to do. Actually, it wasn’t only the duck rillette I wanted to try, but also the Lincolnshire smoked eel with celeriac rémoulade. I had been eyeing it up on both my first and second visits, but some other dish would call out to me more. This time round, I promised myself that there would be no distractions of such nature. And so, the eel was the first thing that rolled off my tongue when the waitress came to take our order. 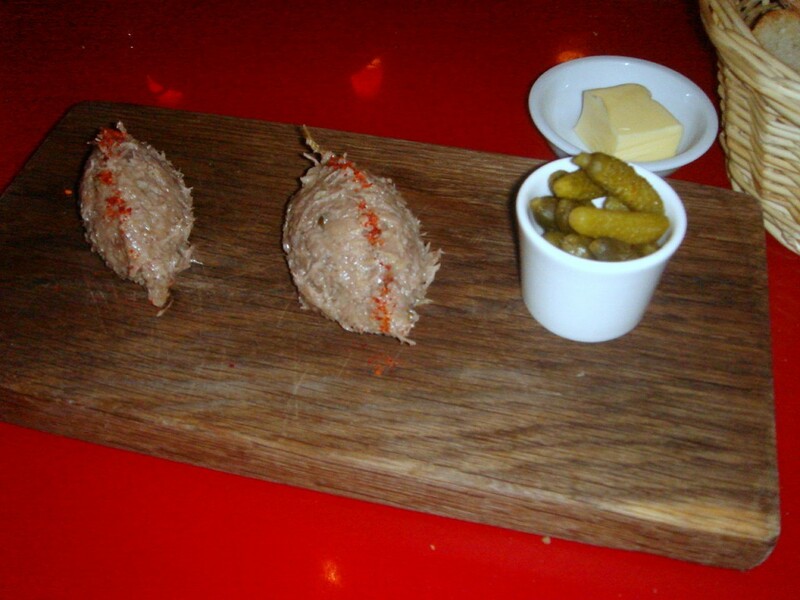 Oh that, and the duck rillette of course.